One of the principles that continues to ring true in business is "change" and we are accelerating our requirements for new models like never before. You might have heard about Microservices and how the principle of loose-coupling promises to solve so many problems. One problem that can be introduced though is the loss of visibility into the state of a business transaction when using a choreography over an orchestration. There are ways to solve this however, and I took some time this week to put together a solution. Before we dive in, let’s cover some principles just to make sure we are all on the same page. Many of these principles are not new. 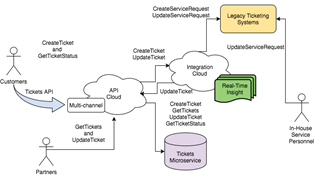 I wrote about Microservices and the Integration Platform a couple of years ago. Many in the SOA world often employed the orchestration pattern where the business transaction was managed across multiple services by an orchestrator service. This is a valid pattern, and there are cases where it is necessary, but there were also cases where it was overused. For example, for nothing other than to maintain visibility of where we are in a particular business transaction. Microservices introduced (or rather reminded us) of the choreography, where services all work independently, and are focused on their individual part of a complete business transaction. Read the complete article here.